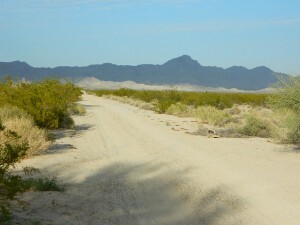 Several miles south of the town of Needles numerous desert washes cross the highway with dirt roads leading off into both directions. Turtle Mountain is just one dirt road to explore in this region, but there are many more unmarked, secluded roads. 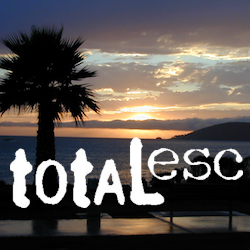 This region is perfect for “campers in-route” traveling who need a quick overnight camp spot (off the freeway). BLM signage along US Hwy 95 is minimal. Look for vertical brown markers w/ reflectors, numbers or names. Driving slower than typical traffic, coast at 50 mph and keep your eyes peeled to the west side. Turtle Mountain Rd is marked at the pavement, but the marker is very small. Exploring the eastern side of Southern California, one can find the Colorado River and Arizona border region an excellent destination for winter camping. Springtime offers wildflower blooms, open camping and decent weather with sunny 70 degree days. Wildflowers and BLM beauty awaits those who venture off the paved routes. Palo Verde trees line the washes and much vegetation can be seen throughout this remote region. 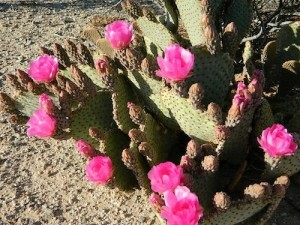 Cacti include the cholla, ocotillo, barrel, beavertail, just to name a few. Wildflower blooms here are just as good as Anza Borrego Desert SP. Drive more than a mile from the highway if you plan to camp in peace and quiet, as the overnight truck traffic goes all hours. RV accessible camp spots are few and far in between. They can be found in large, level pullouts close to the main road, but you will be hearing traffic zoom by. Some dirt roads are in better shape than others; Seasonal storms in the low desert can wash out even paved roads. 4×4 may be needed in some areas. 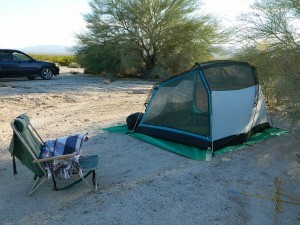 Open camping in this desert is free and there is plenty of room to spread out. Imagine not seeing anyone pass by your camp or drive down your road for days. Camping in a sandy wash may seem appealing, but you best know the weather forecast and if rain is at all predicted nearby, be prepared to break camp (in the middle of the night) before a flash flood hits. The Needles BLM Rangers Office is located on US Hwy 95, on the south edge of town and they can provide maps and more information.